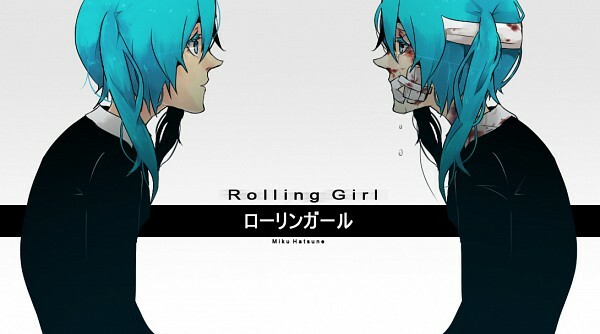 Hatsune Miku sometimes referred to as Miku Hatsune, is a humanoid persona voiced by a singing synthesizer application developed by Crypton Future Media. Hatsune Miku is a 16-year-old girl with long, turquoise twintails. She uses Yamaha Corporation's Vocaloid 2, Vocaloid 3 and Vocaloid 4 singing synthesizing technologies. She also uses Crypton Future Media's Piapro Studio, a singing synthesizer VSTi Plugin. She was the second Vocaloid sold using the Vocaloid 2 engine (the first being the English Vocaloid Sweet Ann), and the first Japanese Vocaloid to use the Japanese version of the Vocaloid 2 engine. Her voice is modeled from Japanese voice actress Saki Fujita. Hatsune Miku has performed at her concerts onstage as an animated projection hologram. The name of the character comes from merging the Japanese words for first, sound and future, thus meaning "the first sound from the future", referring to her position as the first of Crypton's "Character Vocal Series." Hatsune Miku was the first Vocaloid developed by Crypton Future Media after they handled the release of the Yamaha vocal Meiko and Kaito. The name of "Hatsune Miku" was conceived soon after the Vocaloid 2 announcements, when an English and Japanese vocal were developed for the character. The intended design was delayed, and was later used for Megurine Luka instead. Miku was intended to be the first of a series of Vocaloids called the "Character Vocal Series", which included Kagamine Rin/Len and Megurine Luka. Each had a particular concept and vocal direction. Making a fuss if you got inside her head and disturbed, disturbed. “No problem.” Was murmured, but weren’t those words lost? After ending your search for mistakes, it spins again! Overlapping voices with voices and blending, blending. “No problem.” Was murmured, but those words were lost. How are you going to turn out good? Even the hill tempting me is making mistakes now. I wanna stop my breathing, now.